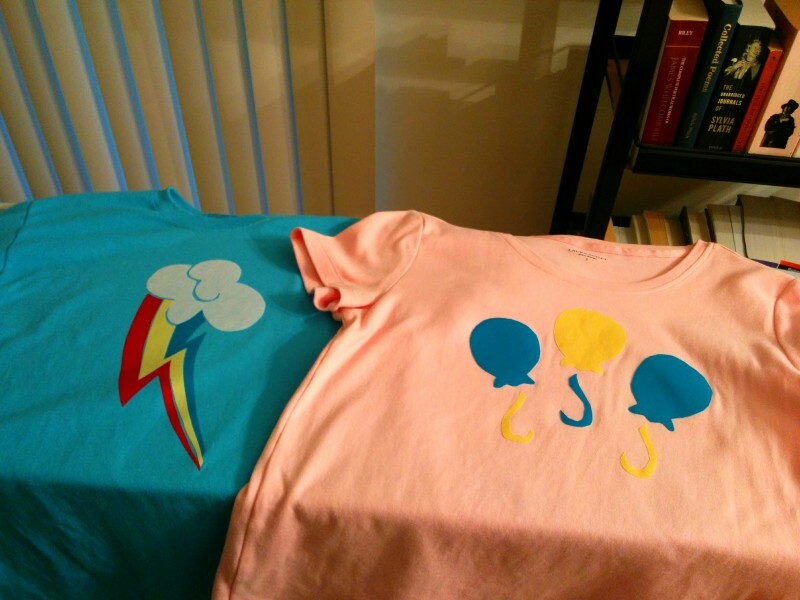 Cutie Mark T-shirts: make your own! 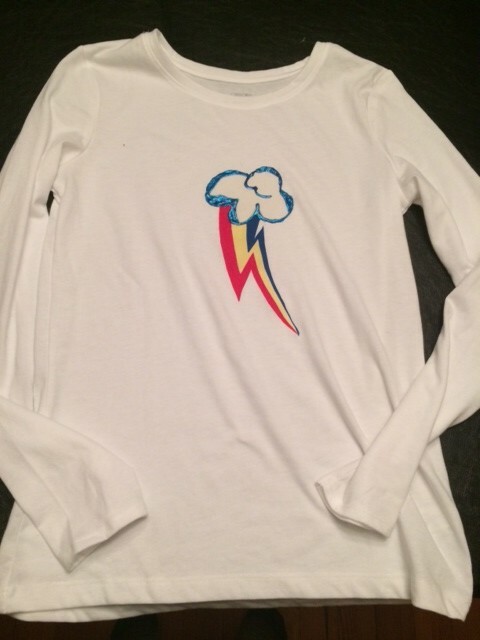 Have you ever wanted your own t-shirt with your favorite My Little Pony’s cutie mark on it? (Or a t-shirt with a simple cartoon symbol, like Super Mario’s 1-Up mushroom or other relatively low-detail images) Well, here’s a tutorial for you – and all you need to know how to do is operate an iron! Step one: time to put those scissors to work. The first thing you’ll want to do is cut out pieces of fabric a little larger than each different area of color in your image. 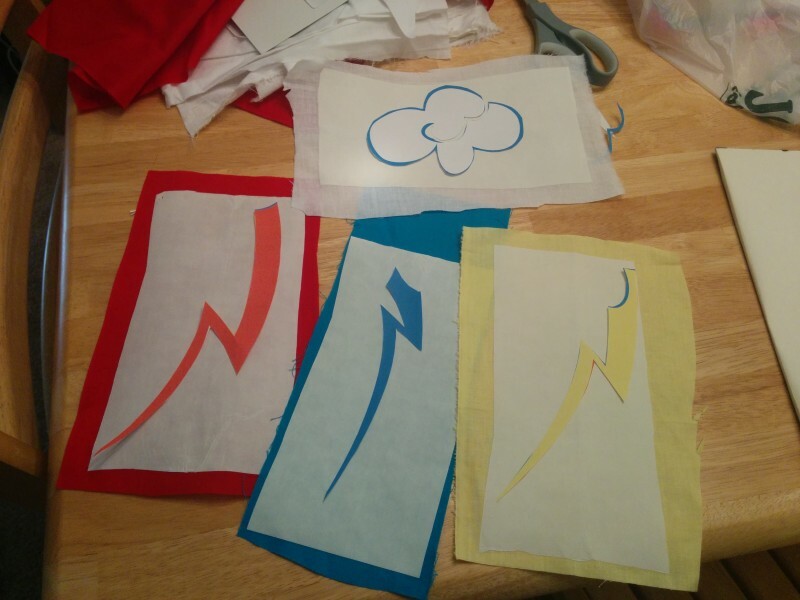 I ended up with four pieces of fabric – blue, red, yellow, and white. 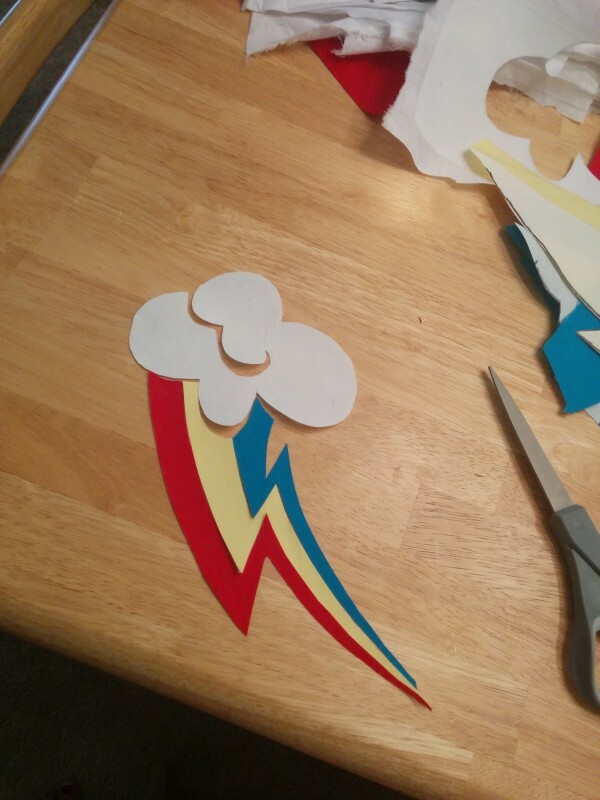 While you’re working with the scissors, you’ll also want to cut apart your image – I cut mine into different sections based on the colors in Rainbow Dash’s cutie mark, and ended up with a cloud and three little lightning bolts. You’ll also want to get out your Heat ‘n Bond, too – and cut out pieces that are slightly smaller than the pieces of fabric you’re using. Step two: Get out the iron! Next, it’s time for the iron. 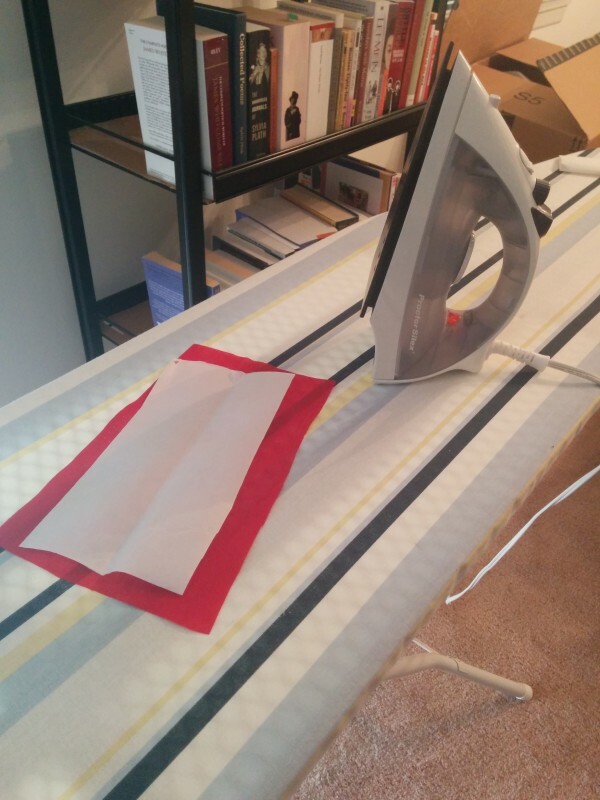 Lay out your piece of fabric, then lay the Heat ‘n Bond, paper side up, onto your fabric and follow the instructions on the package to iron your Heat ‘n Bond to your fabric. Step three: tracing our pieces! 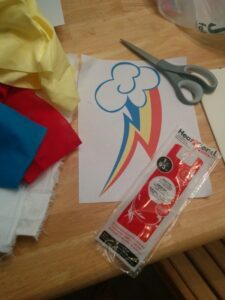 The next thing we’ll do is get out our marker and trace our cutie mark pieces onto the Heat ‘n Bond paper. Step four: cutting out the fabric shapes. The next step has us cutting out the fabric shapes. It’s also not a bad idea to re-assemble the shape to make sure everything fits together – if not, you can trim things a little bit to make them fit. Step five: lay out your design, and iron away! This is where the fun stuff happens. 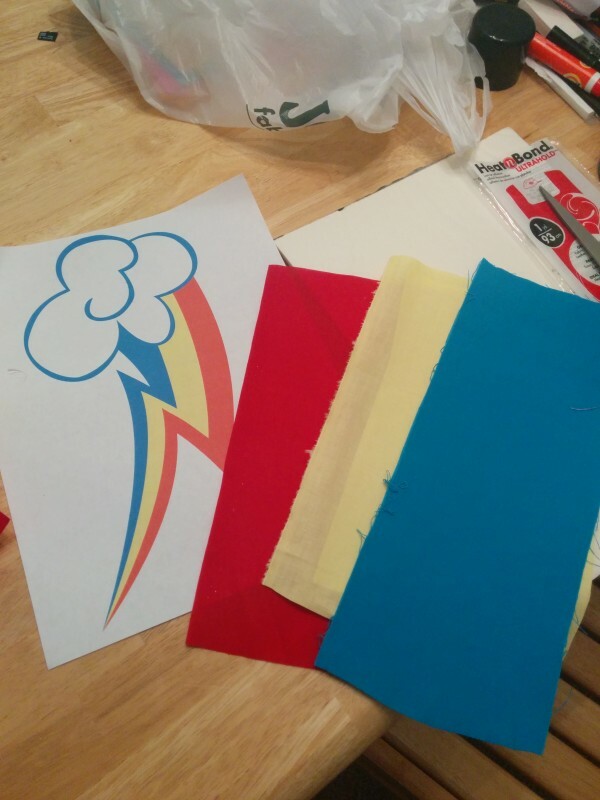 Peel off the paper backing from your pieces of cutie mark, and lay out the pieces on your t-shirt where you want them to end up when you’re finished. Iron them onto your t-shirt according to the directions on the Heat ‘n Bond package – you may want to pay special attention to pointy ends that might come up if not properly adhered to your shirt. 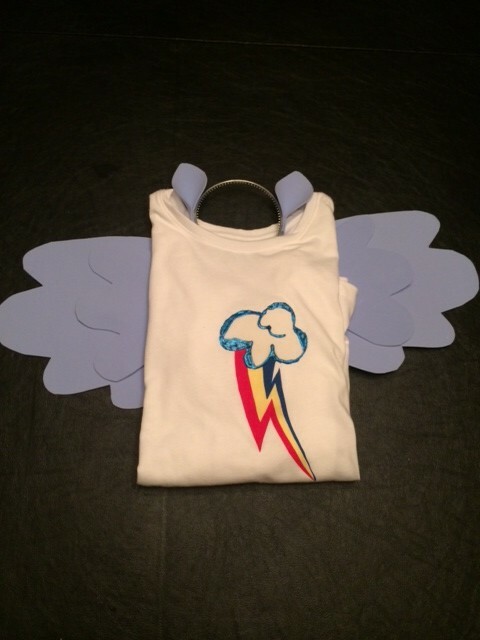 Step six: wear your t-shirt! Once your shirt’s cooled off a bit, and you’re sure everything’s securely ironed onto your t-shirt, now you can wear it! 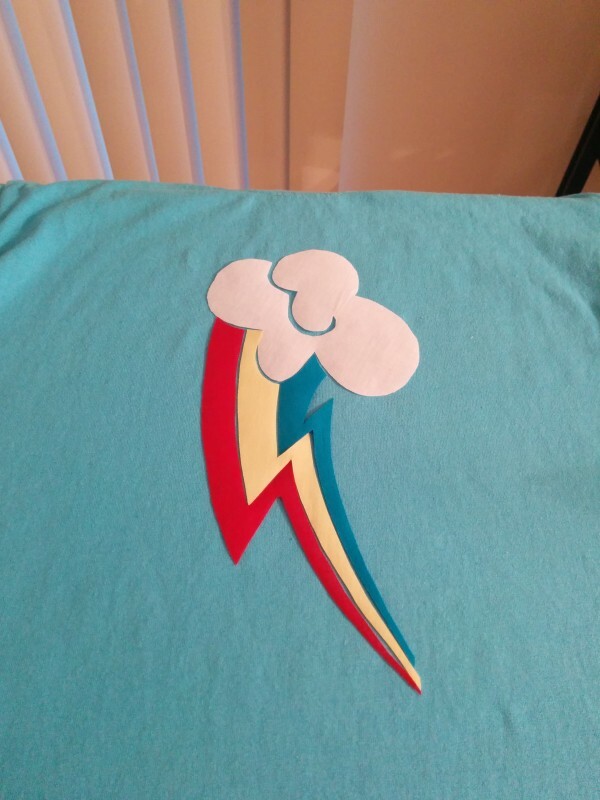 This is a pretty fun way to make a unique looking t-shirt – I’ve worn my Pinkie Pie t-shirt to conventions and received lots of compliments on it, and some people even thought it was screen printed – when I told them I did it with fabric and Heat ‘n Bond, they were amazed! And as I said earlier, you can do this with any sort of simple graphic that doesn’t have a lot of detail to it. If you follow these steps to make a t-shirt, show me the results! I have a t-shirt problem. Yes, everyone, I have a t-shirt problem. And it might be getting out of control, heh. It hit me earlier this week, when I got this new t-shirt in the mail – found it on Ript during the last day of GenCon, ordered it when I got home, and promptly took a picture of it upon its arrival. As I was neatly arranging my new t-shirt under Toothless, I thought of the many other t-shirts I owned, and thought it might be neat to pull them all out and see just how many awesomely nerdy t-shirts I had. And so I did.